We’re in the swell of cold and flu season still, and while that sounds miserable, isn’t it nice the way it keeps us all the more conscious of savoring clean, soothing, nutritious fuel? This versatile, comforting, rich and wholesome soup will fill you up and calm you down…in a nice, just breathe kind of way. 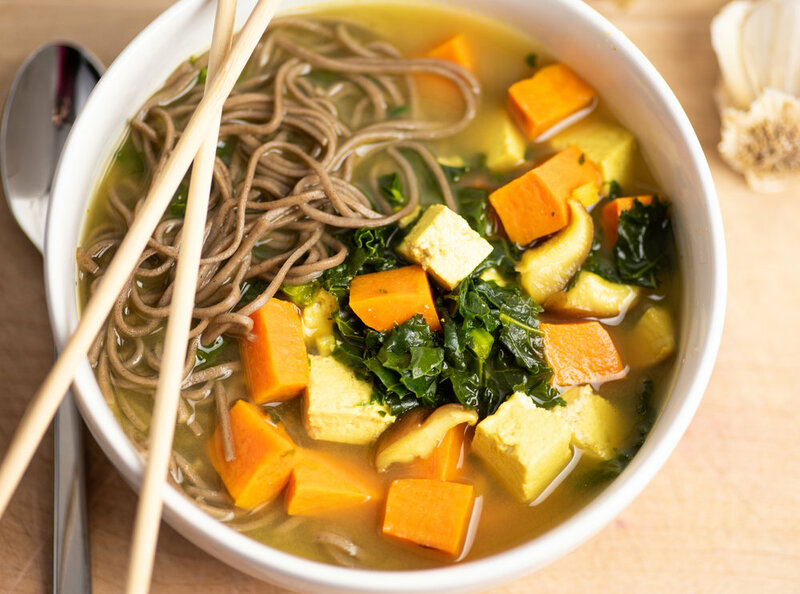 It packs some powerful goodness, with the likes of shitake mushrooms, ginger, turmeric and dark greens, and it can handle a little extra heat—or tone down- a notch—with ease. Maybe it won’t be the panacea to keep all colds at bay, but if you do succumb to something, pretty sure it won’t be because of the soup. You know what the world could use a little more of? Umami. Gentle but firm-in-its principles umami, of a plant-based, wholly accepting ilk. No, it didn’t take long to jump to an extended food metaphor…oops. I volunteered in Chef F’s class the other day, and it was lovely. At the same time, there were some heart tugs. Through years of teaching Kindergarten, it was common for parents to be just a bit stunned seeing a whole different persona coming from their child at school versus at home. Last week, I was struck but not surprised, seeing this other, shy version of the vibrant, creative, extremely talkative and even rambunctious child who owns our home. Outside the fold, he is and has always been sociable but not social. Cautious observer and thinker, first. At school, this is immediately clear. Chef F was SO well-behaved. This is WONDERFUL, of course, but contains just the littlest bit of ache. He was so attentive and careful, quietly eager to please but notably restrained. Chef F enjoys school. He is well-liked. There is nothing to worry about. But of course I will worry, anyway. More often, I will reflect with flecks of worry. Growing up, teachers told my parents how painfully shy I was. I knew this to be a ‘problem’, to the point that I regret just how much I later flung myself into prioritizing being social once socializing became comfortable. Why is it that our society holds gregariousness up with such esteem? Why does a little shyness have to be “painful”? Dave comes across as on the quieter side, but being from Britain it’s considered “British reserve”, and even classy. Why are we so much less tolerant of introspection in certain contexts? Umami is comfortable with its many notes—its light, peppery zings and its rich, mellow darkness. Umami is humble, yet sings unashamed. It it loved, and loving. Umami isn’t saccharine with sugar or caustically bitter. It doesn’t hog the spotlight. It just is. So back to the soup—here is flavorful umami just brimming with goodness. Plus, it is open to added punch—some extra ginger or chili (yum). This is especially timely, with the Year of the Pig just around the corner (gung hay fat choy, every one!). Add it to your arsenal to fend off germs, and soothe some worries, too. Especially the small stuff, it will remind you—as it also reminds you, it is all small stuff. Heat a large stockpot coated with cooking spray over medium heat. Add garlic and ginger, and cook a few minutes until softened. Add water, stock and soy sauce, and stir to combine. Add sweet potato, mushrooms , tofu and kale to the pot. Bring to a light boil, then reduce heat and simmer approximately 12 minutes, until sweet potato has softened. In a medium pot, prepare soba noodles according to package directions. Set aside. Add miso and stir to mix in. Divide noodles among bowls. Pour soup on top and garnish with scallions.